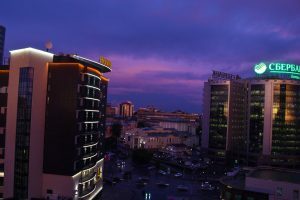 View from Azimut hotel in Novosibirsk. We arrived in Novosibirsk early in the morning and walked towards our hotel. It was a bit cold that morning, about 6 degrees Celcius, but we were in Siberia after all, where the number one thing they are known for is the cold. The hotel was a fifteen minute walk away from the train station, which meant that we finally got to use our backpacks for what they were made for. We stayed at a hotel called Azimut, a quite large hotel with a lot of rooms, for the neat price of about 2000 Rubles per night. While checking in and paying the amount, I thought with deep regret about the couple of Caesar salads we paid 3500 Rubles for in Moscow earlier on this trip. 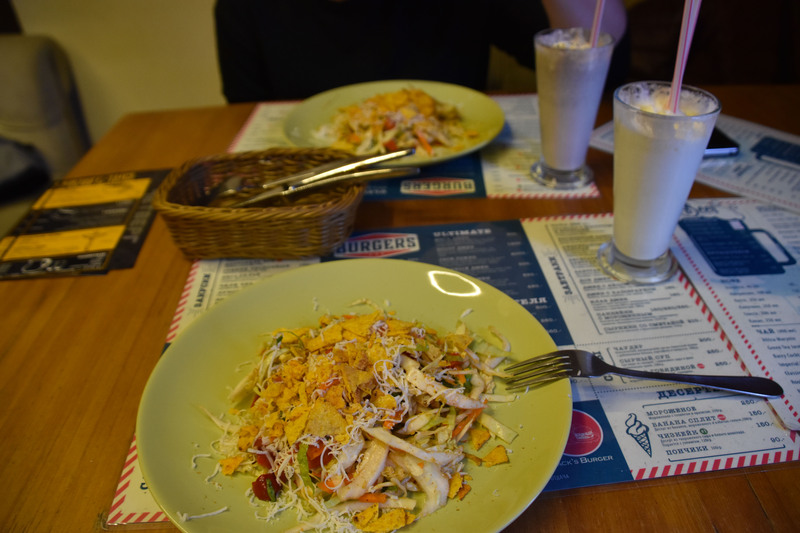 That’s right, two Caesar salads for the price of almost two nights at Azimut hotel in Novosibirsk. The 2000 Rubles per night was after upgrading to a slightly better room when we arrived, as this allowed us to check in early in the morning. That was a great relief, as we were in serious need of some more sleep. My fiancé handles sleep deprivation better than me – I tend to become grumpy and hateful. 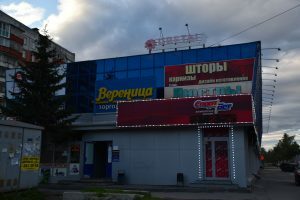 When we woke up a few hours later, we ate at the slightly overrated restaurant SibirSibir, located in the same building as the hotel. It was expensive, overhyped by the receptionist and just average, and the salmon pie I ordered was not salmon, but white fish. 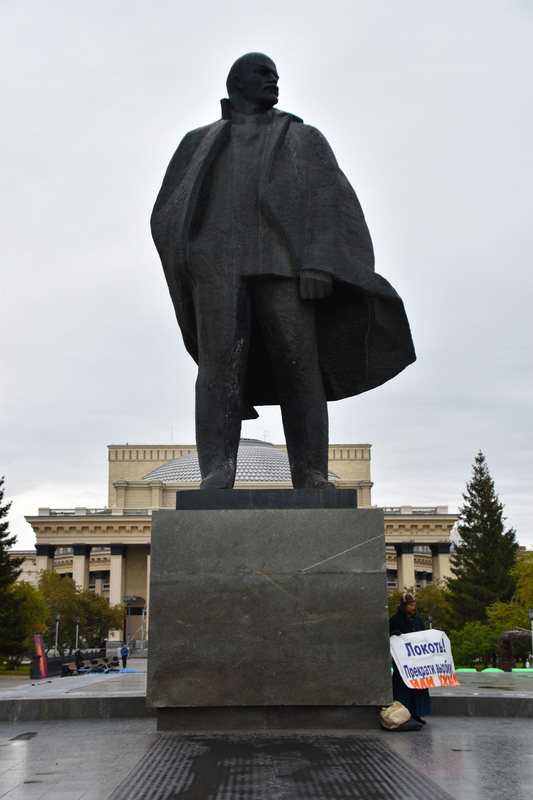 Lenin on Lenina Square, and a woman protesting against deforestation. We took a walk to Lenin square, where we were met by comically loud music in the park right behind the monument of the dead communist hero. Through what must have been enormous speakers, they played only what seemed to be the first ten seconds of one specific tune, before pausing and then repeating, but sometimes turning it louder. I am not sure what kind of event they were preparing for, but I do know that had I not had tinnitus before, I would probably have walked out of that event with it. 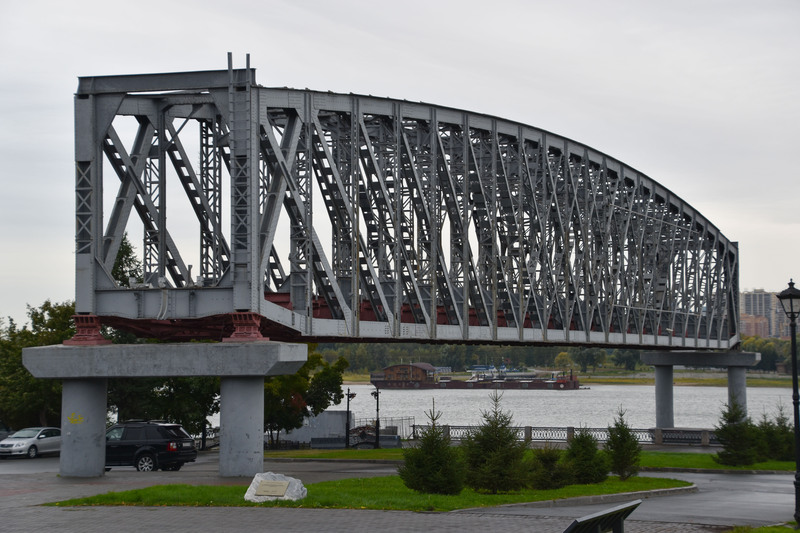 Novosibirsk was yet another city of a lot of walking to see monuments, statues and some architecture. It’s a relatively new city, popping up after the Trans-Siberian railway appeared, so it doesn’t really have any old buildings. For some reason, I had a feeling that the city houses many hipster, but I could of course be wrong as this is based on nothing in particular. We walked to the promenade down by the artificial lake, where we inspected the old train bridge which they have preserved parts of. “Cool bridge”, my fiancé said. 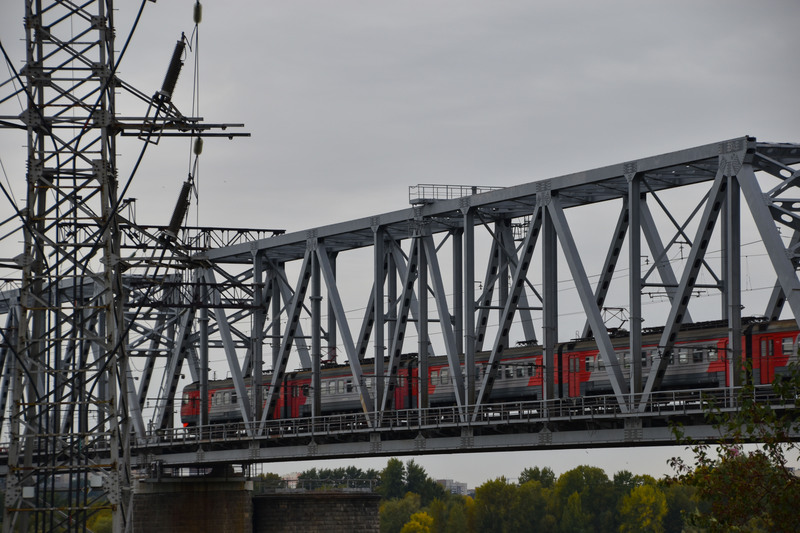 “Yes”, I answered, and we concluded that we had inspected the bridge sufficiently. While standing there, we saw two people walking with fishing rods by the lake. As my Norwegian-Russian pocket phrasebook had devoted two whole pages for words and sentences related to fishing, I was temped to shout a few of the sentences at them, just to practice my Russian. I considered yelling something like “eta otsjinj kharosjij olov!” (this is a good catch! ), even though they clearly hadn’t caught anything at all. I chickened out. Novosibirsk was also a city where we did spend quite a bit of time eating in restaurants and cafés, just like you often do a lot more of while vacationing than when you are home. 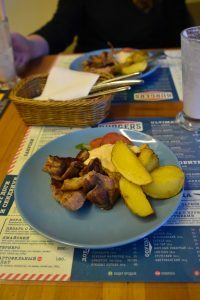 It is a statement more true for Norwegians than any other people in the world, as it is cheap to eat out in every other country in the world compared to Norway. Maybe except Switzerland. I once ate a 25 Euro vegetarian salad in the restaurant wagon of a train in Switzerland, and that was the cheapest dish on their menu. I regret it almost as much as the before-mentioned Caesar salads on Red Square in Moscow. First dish of a business lunch, at Jack’s Burgers. For some reason, we didn’t order a burger when we ate at Jack’s Burger. We ordered a business lunch and a milkshake, and business lunches in Russia are usually three courses with plenty of food. This place was certainly not an exception. Being so satiated from the enormous amount of food, I fantasized about laying down on one of their three-seaters for just a little while. But I guess it could have been worse, because on their menu they had a 2800 gram burger, consisting of eight patties of meat. You could get that burger for the neat price of just 2000 Rubles (better known as a room at Azimut hotel). As part of the deal, you would also get sick of hamburgers forever, and maybe just the slightest little heart attack. Except for a warm Kronenbourg Blanc and a bit slow service, the lunch was pretty alright. Third dish of the business lunch. Second dish of the business lunch. We spent the rest of the evening relaxing at the hotel, then went to eat a platter of fried stuff at a place called Ambar while drinking a few beers, then went back to the hotel for some sleep. 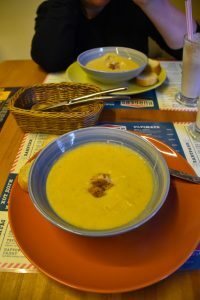 The next day, which was our last day in Novosibirsk until our train journey towards Irkutsk and then Ulan Bator, we had some specific goals for what to do. 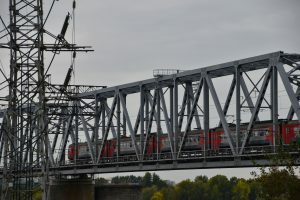 We were going to the zoo, we were going to find a geocache, we were going to shop gloves and knit caps for cold Mongolian nights, we were going to shop a charging cable for my GoPro and we were going to shop some snacks for the long train journey. As part of our tradition, we walked so much that day that our knees and backs were starting to ache. Maybe we’re getting old, or maybe walking on asphalt all day isn’t good for your body. We spent four hours in the zoo, visiting every animal they had, except for the dolphins. They seemed to charge extra to see the dolphins, and by the time we discovered that they had dolphins, we were mentally prepared to leave. 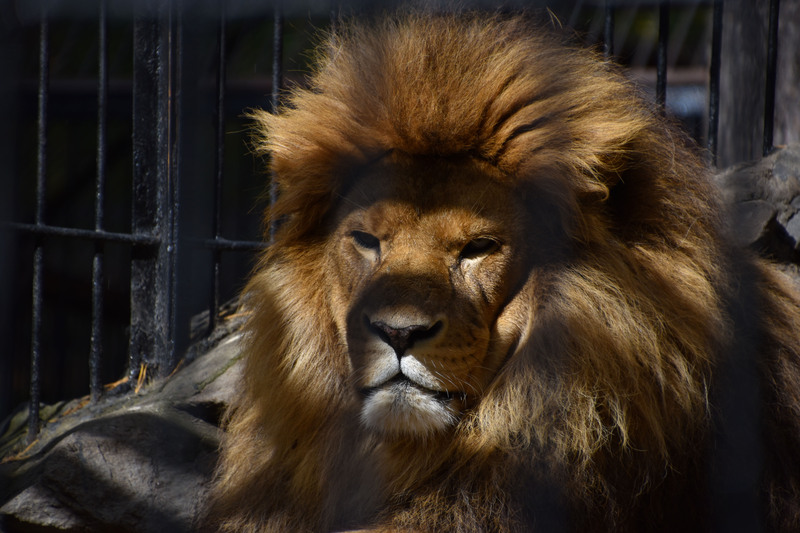 The amount of different animals in the zoo was absolutely fantastic. I love animals and my fiancé does too, but I’m like a child when I see them. I tend to forget that I’m an adult. I was once so excited when seeing the otters at Lofotakvariet (in Svolvær, Norway), that my fiancé overheard someone saying “An adult man! Not letting the kids go in front of him to get a view of the otters!”. So that’s me when I see animals. 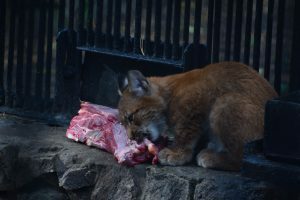 Not only did they have exciting animals like tigers, lions, polar bears and a liger (lion/tiger combination), but they also had various animals I wasn’t aware of, such as the Siberian Lynx. 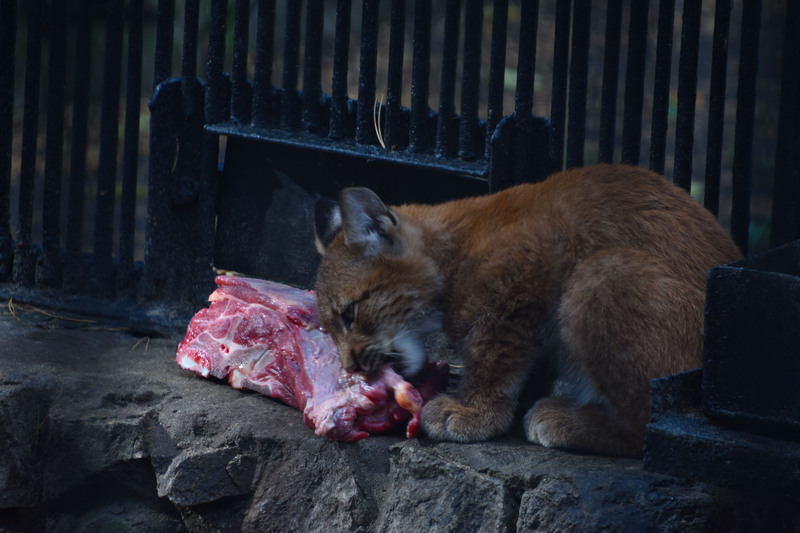 Siberian Lynx enjoying some meat. 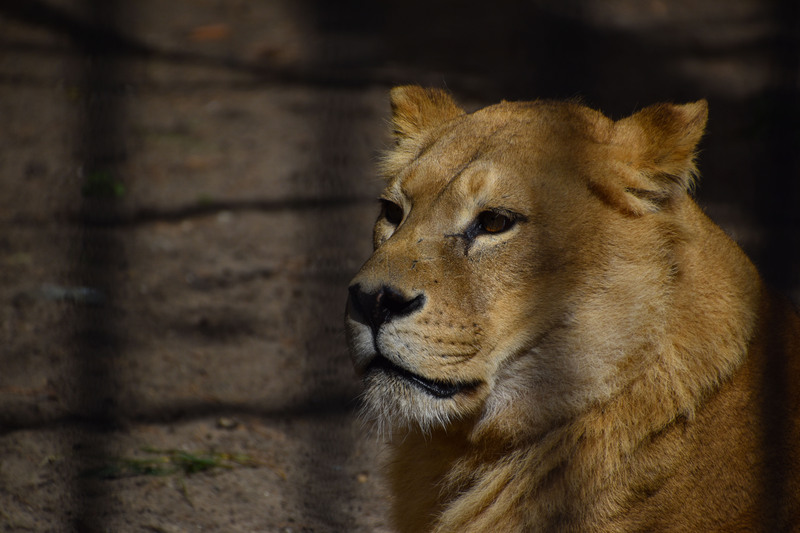 The zoo was great, but there were a few things that disappointed both of us. Some of the animals were in cages that were obviously too small for them. 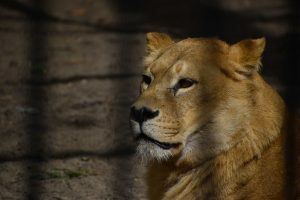 Whomever in charge seems to have made a few strange decisions when placing the animals in their cages, because some of the smaller animals had cages that were many times the sizes of what larger animals were in. There also seemed to be vast areas of unused space in the woods around the zoo which they could have used to keep bigger cages. 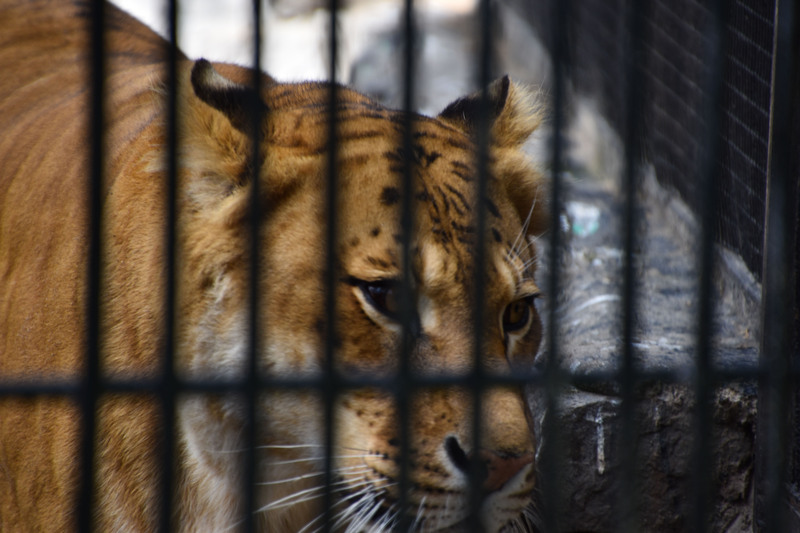 Another thing that was slightly worrying was that you could easily stick your hand through the bars of most cages, such the cages of the tigers or lions. I guess getting your fingers bitten off is called learning the hard way if you’re a sane adult, but I could easily imagine a situation where a child could run away from his parents for a few seconds to say hello to the big cat who unfortunately hadn’t been fed in a while. After saying hello to every one of the animals on the zoo, we were heading for the exit. We suddenly realized that there was a geocache close to the park, and that it was one of just a few in Novosibirsk. Geocaching is a sport where you locate physicals containers around the world based on their GPS coordinates, you sign the physical log book and you log it as found online afterwards. It’s a great way to discover new places, and we’ve been doing it for a few years, although we are less active now than before. The geocache was one of just three in Novosibirsk, which is unusually few in cities of that size. There were only three in Omsk too, but we couldn’t find any of them. I guess geocaching is not very popular in Russia yet. We have a tradition of finding at least one geocache in every country we visit, so it was a little bit important for us to find one in Novosibirsk since it was practically our last available day in Russia. 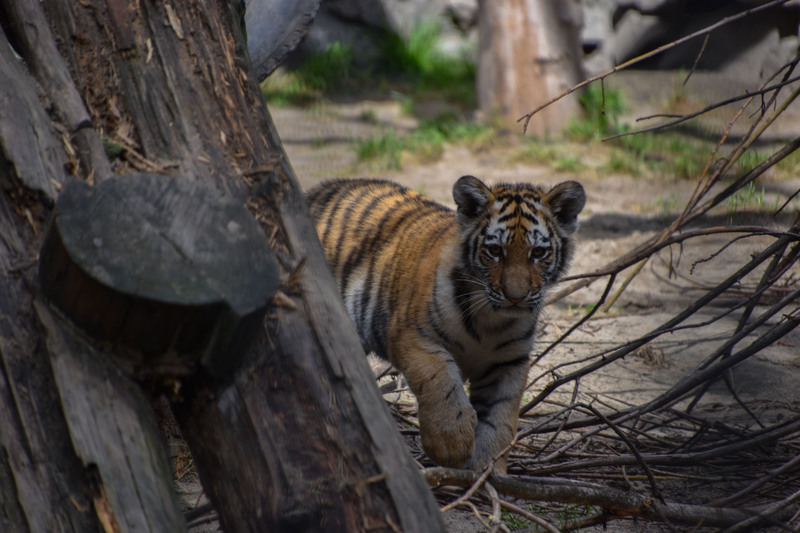 While walking towards the cache inside the park and getting closer with every step we took, we were soon met with a large fence which separated the zoo from the botanical garden where it was located. This meant more walking, as we had to leave the zoo, enter the botanical garden and walk deep into its woods. After looking for the geocache for a while at where it should obviously have been, we concluded that someone had removed it. That’s not too uncommon when someone who doesn’t like or understand the sport stumbles upon these plastic containers. This, of course, meant more walking, as we had to get to the next geocache. It was located at the train station, which we fortunately found relatively quickly. Placing suspicious boxes around train stations is of course not a good idea for obvious reasons, but this was a tiny, magnetic and innocent-looking container. While walking to the hotel from the train station, we stumbled upon a small market with signs outside showing great prices on knit caps and gloves, which was exactly what we were looking for. The shop selling them was filled with racks upon racks with various cheap clothes, which probably originated from China. A bag with the Jeep logo was one of the items they sold, in addition to leather jackets that didn’t smell like leather and suits that were suspiciously cheap. We got our caps and gloves for cheap, so it was a great find for us. On the floor beneath this shop, they had various tiny shops selling food like beef and cheese wheels. One tiny shop curiously enough seemed to specialize in selling remote controls for various brands of TVs, which is a business concept I find very fascinating, as I cannot imagine that they would have many sales a day. But for all I know, maybe losing remotes is common in Russia, and maybe people from all over Siberia go to that particular shop to get a replacement. Anyway, I got a new charging cable for my GoPro at a shop right next to the remote control specialist. Afterwards, we did some grocery shopping at a supermarket close to the hotel. We spent six and a half hours walking that day, so it was nice to relax a little bit at the hotel before going to train station to board our post-midnight train. After all the walking, we felt we deserved to take an Uber to the train station, although it wasn’t very far. 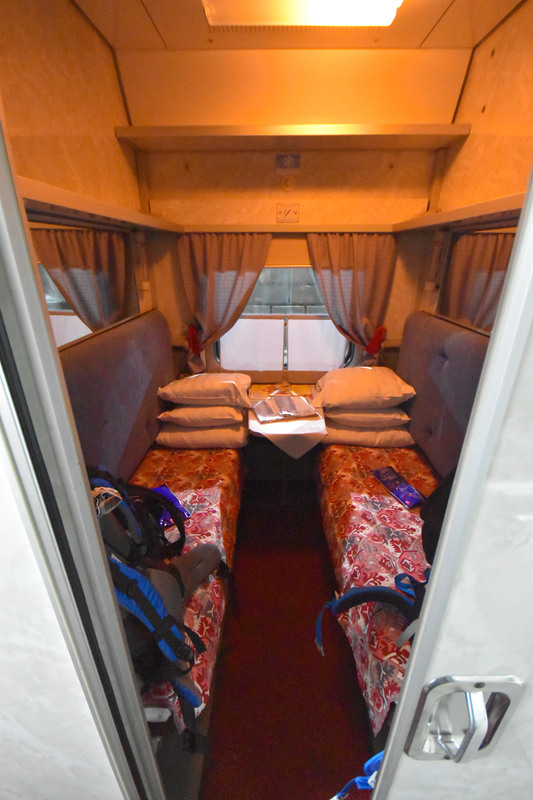 First class compartment in Russian train 008HA. As seems to be custom for Ubers in Russia, this one didn’t have any seatbelts either. Like almost half of the cars we saw in Novosibirsk, this Uber had the steering wheel on the right. This is so common in Novosibirsk that there were ticket machines to enter the parking lot at the station available on both sides of the car. 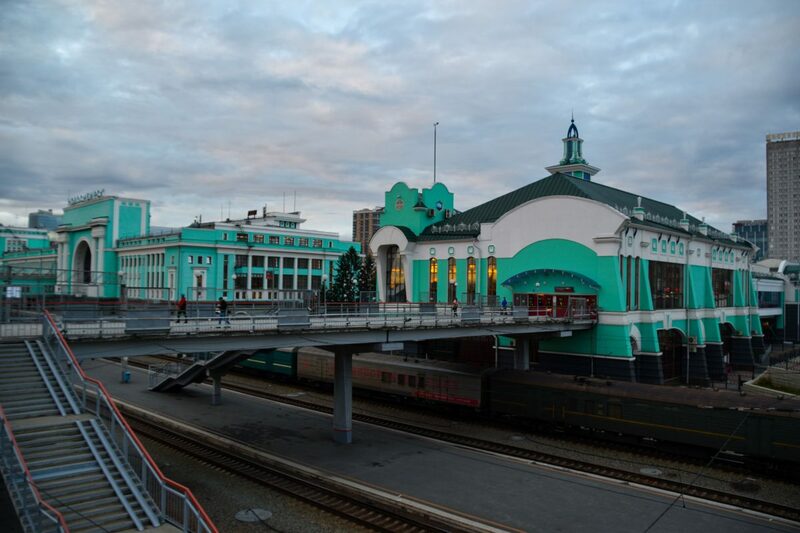 We soon located our train number 008HA heading in the direction of Vladivostok, but we would stop in Irkutsk to change to the Trans-Mongolian, heading for Ulan Bator, Mongolia.